It’s rare to find anyone in America today who has absolutely no debt. And if you happen to be one of the great number of folks who finds that your debt is quite the stubborn thing, as it’s something that just seems to grow over time, then taking the stand to stop that growth may be just what you need to derail its momentum. How are you doing today vs last year on the debt front? Are you up, down or flat? Over here, at The Digerati Life, I’ve introduced a few ways and ideas to reduce debt. We’ve also had a variety of debt challenges in the past, thanks to great companies that spur some of these mini movements (e.g. SmartyPig’s Race Out of Debt, Go Debt Free with PerkStreet, and Lending Club’s DebtBuster Challenge). As you can see, the message here is to make debt reduction a priority. As a nation, we’re addicted to credit and to spending. Sometimes, it’s the whole “keeping up with the Joneses” or instant gratification or the feeling of entitlement that makes some people begin their debt spiral. Sometimes, it’s a hardship event, like extended unemployment, a chronic illness or divorce that starts it all. Then there are those who fight a variety of addictions, which then lead to long term financial troubles. Some of these problems are pretty hard to deal with and can entail professional help and assistance. But if you are in a position to make a stand, I would like to offer you some extra resources to help you improve your financial health. The online financial community has consumer debt in its sights and is keen on sharing many creative ideas and strategies for getting rid of debt. Ultimately, we can only answer to ourselves when it comes to dealing with our money. Sure, others can try to motivate us into getting our finances and budget under control, but if we don’t make that commitment ourselves and actually execute on that commitment, then nothing is going to happen. On that note, I would like to introduce you to the “Crush Debt Challenge” from Man Vs Debt, which is run by the popular debt blogger, Adam Baker, as well as Adaptu, a new financial site that I just came to know about. Adam Baker is well known in the financial blogosphere as someone who is passionate about eliminating debt and who enjoys travel, living the location independent lifestyle and being frugal. And he’s gone that extra step with his message of “sell your crap, pay off your debt and do what you love” by traveling the U.S. in an RV with his family. What’s even more cool is that he was able to bring in a sponsor to join him on his adventure. 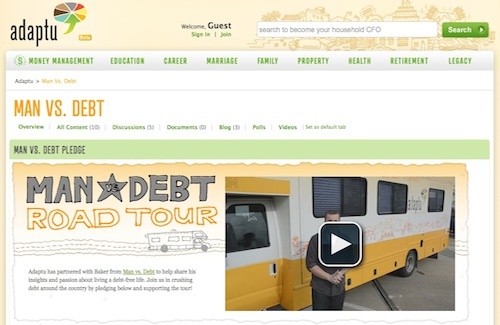 Adaptu.com has thus partnered with Man Vs Debt to tour the U.S. to meet with friends (online and off) at different stops, to talk about Adaptu and the Crush Debt Challenge and to talk about the RV lifestyle. Yesterday, the Man Vs Debt team met with the SF Bay Area online community for some socializing. So here’s a pic I snapped of Adam’s awesome RV. I even saw a pedestrian take a picture of his vehicle as they were passing by. It’s truly the eye catcher — and what’s more, Adam treated us to the interior of his RV and a talk on what family life on the road is like (it just seems so liberating!). Man vs Debt somewhere in the SF Bay Area. Thanks for the tour, Baker! Now if you’re all about feeling liberated, let’s return to the Crush Debt Challenge, which you can check out on Adaptu.com. I’ve taken a look around this site, which is where you’ll find the Crush Debt community as well as many financial tools that can provide you transparency about your money and debt status. You can open an account for free and get started with making the pledge and kicking your debt to the curb. Crush debt with a pledge to pay off $1,000. What’s great about the pledge (to pay off $1,000 of your debt) is that it is something actionable and feasible. The challenge also brings in an extra factor that could help with debt reduction: a community of people who are sharing the same goals. When it comes to motivating ourselves to meet tough goals, it helps tremendously to share the journey with others. There is support and camaraderie in a group and many times, being with other like-minded individuals can make a difference with sticking to a goal or commitment. 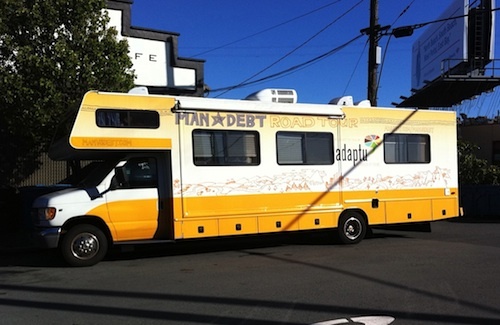 I want to say thanks to Adaptu and Man vs Debt’s Adam Baker for inviting us to the SF Bay Area Crush Debt meet up. I certainly had a blast! There were lots of attendees, including many bloggers and friends from the financial community. I was really glad to see many familiar names in the financial technology space as well. This space is one dynamic, thriving beast, that’s for sure! I have no debt except for my small mortgage! I am adding an extra $100 per month to my mortgage to have it paid off by the time I retire. I need to get rid of student debt. Perhaps I should try this out!